Instructions for Guests Free parking is available in the West Lot. Cross the campus road and enter Lundquist Community Life Center (CLC). The artist talk and reception are on CLC level 2. 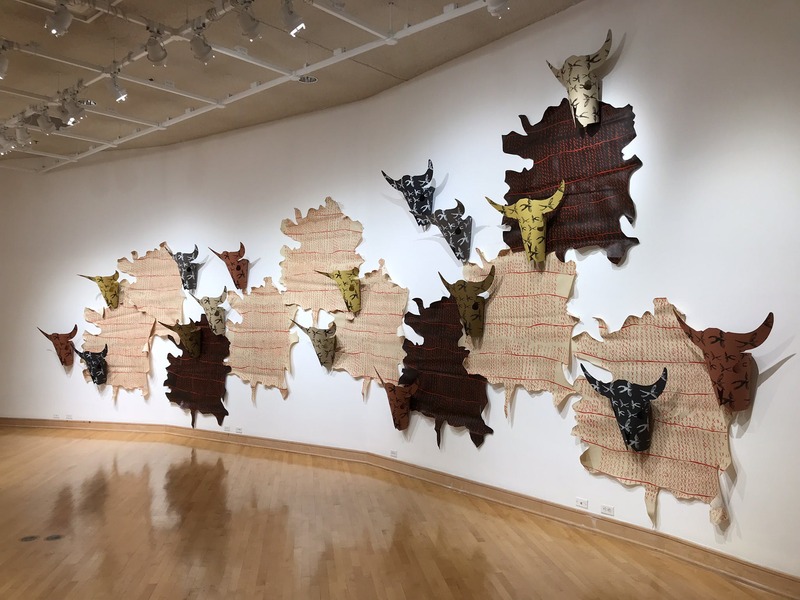 Featuring prints and an installation by John Hitchcock, the exhibition explores the intersection between cultures through the land, language, and the visual symbols of the Great Plains-the epicenter for Plains tribal culture. Hitchcock draws from his experiences growing up on native land that sits adjacent to Fort Sills in Oklahoma. He utilizes drawing and print making processes to convey personal symbols and layers of thoughts about removal, displacement, and belonging. Hitchcock will give an artist talk about his work on February 28 at 6 p.m. in the Eastlund Room (Lundquist Community Life Center Level 2). An opening reception will follow in the Olson Gallery. John Hitchcock is an Artist, Professor and Associate Dean of Arts at the University of Wisconsin- Madison. He earned his MFA at Texas Tech University, Lubbock, Texas. Hitchcock's work has been exhibited at numerous national and international venues including: "Flatlander: Belonging to The Land" Solo exhibitions at The Plains Art Museum, Fargo, North Dakota (2018), Mulvane Museum, Topeka, Kansas (2018), Ski Club Milwaukee, Wisconsin (2018); "The Shape of Things: New Approaches to Indigenous Abstraction" at the Missoula Art Museum, Missoula, Montana (2018); "Weaving Past into Present: Experiments in Contemporary Native American Printmaking" at the International Print Center New York, Chelsea Gallery, New York (2015) and Museum of Contemporary Native Arts, Santa Fe, New Mexico (2017); "National Sanctuary" Solo exhibition at the Museum of Wisconsin Arts, West Bend, Wisconsin (2016); "Traces of the Plains" Solo exhibition at The Museum of Contemporary Native Arts, Santa Fe, New Mexico (2014); "Songs for Spirit Lake" The Rauschenberg Project Space, New York, New York (2013); "Air, Land, Seed" on the occasion of the Venice Biennale 54th International Art at the University of Ca' Foscari, Venice, Italy (2013); "Envisioning The Plains" Solo exhibition at the American Culture Center in Shanghai, Shanghai, China (2012); the Kumu Art Museum of Estonia, Tallinn, Estonia; London Print Studio, London, England, UK; South African Museum, Cape Town, South Africa; Museum of Contemporary Art, Santiago de Chile; Museum of Arts & Design, New York; Naples Museum of Art, Naples, Florida; Weisman Art Museum, Minneapolis, Minnesota; Exit Art, New York; and the Print Center, Philadelphia, Pennsylvania.